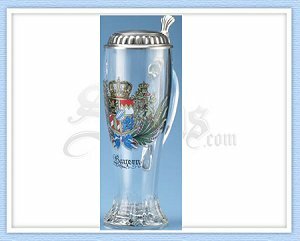 This 5 inch stoneware mug, handmade in Germany, measures a half liter or 16.9 ounces and features the Herz Von Bayern ("Heart of Bavaria") coat of arms. Traditional salt-glazing and cobalt give this mug the classic gray color and the design is hand painted in blue. <br><br> Salt glaze pottery is stoneware with a glaze of glossy, translucent, and slightly orange peel-like texture which is formed by throwing common salt into the kiln during the firing process. Sodium from the salt reacts with silica in the clay body to form a glassy coating of sodium silicate.<br><br> The craft and tradition of salt glaze stoneware goes back to the 15th century, when artisans of the Westerwald region of Germany perfected the craft and developed their signature style of stamped, cobalt blue decorations. This kannenbaecker stoneware mug is hand crafted in Germany and measures 5 inches tall and holds a half liter (16.9 oz) of your favorite beverage. 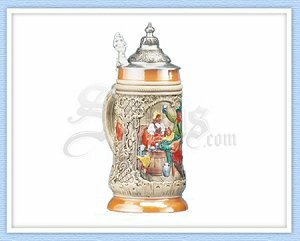 A classic gray salt glaze and cobalt blue stamped Oktoberfest Munchen design complete the piece.<br><br> Salt glaze pottery is stoneware with a glaze of glossy, translucent, and slightly orange peel-like texture which is formed by throwing common salt into the kiln during the firing process. Sodium from the salt reacts with silica in the clay body to form a glassy coating of sodium silicate. <br><br> The craft and tradition of salt glaze stoneware goes back to the 15th century, when artisans of the Westerwald region of Germany perfected the craft and developed their signature style of stamped, cobalt blue decorations. 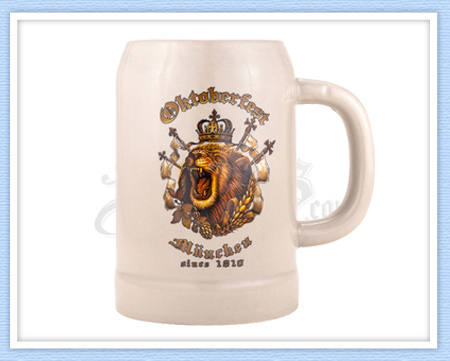 This kannenbaecker mug, hand crafted in Germany, measures 7-1/2 inches in height and holds one liter (33.8 oz) of your favorite beverage. 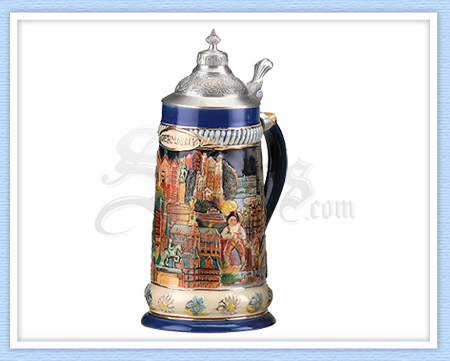 A classic gray salt glaze and cobalt blue stamped "Herz von Bayern" ("Heart of Bavaria") design complete the piece. <br><br> Salt glaze pottery is stoneware with a glaze of glossy, translucent, and slightly orange peel-like texture which is formed by throwing common salt into the kiln during the firing process. Sodium from the salt reacts with silica in the clay body to form a glassy coating of sodium silicate.<br><br> The craft and tradition of salt glaze stoneware goes back to the 15th century, when artisans of the Westerwald region of Germany perfected the craft and developed their signature style of stamped, cobalt blue decorations. 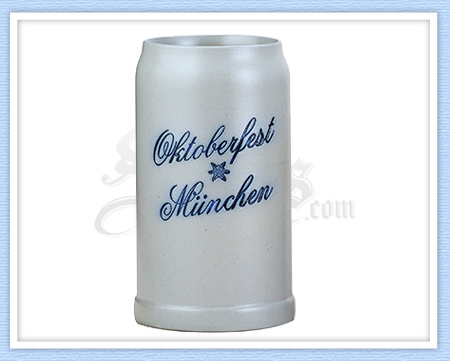 This traditional, raised-relief stein features a Munchen Oktoberfest theme. 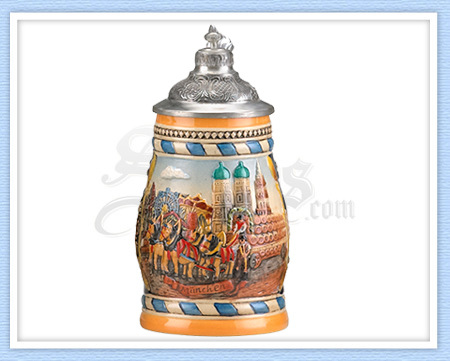 Famous Munich landmarks (Rathaus, Hofbrauhaus, Olympiapark, and Frauenkirche) decorate the sides of the stein, while the center features a Munchen Oktoberfest carnival scene. A rich, cobalt blue glaze completes the piece. 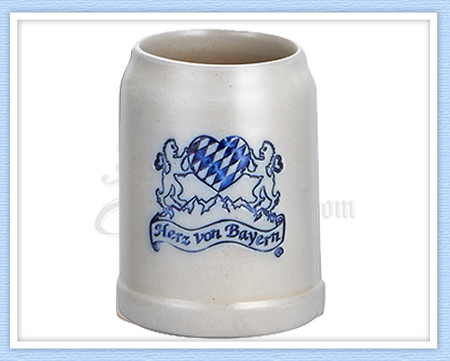 The stein is topped with a detailed, conical lid. 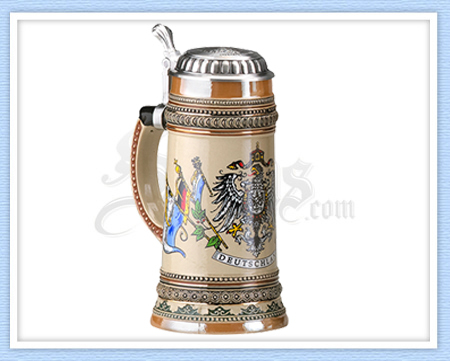 Stein measures 10-1/4 inches in height and holds .75 liters (25 oz) of your favorite beverage. 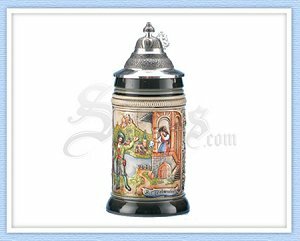 This handsome, raised relief stein features a panoramic view of many of Germany's most well-known buildings and landmarks. The scene is bordered by flowers, gold detailing, and a rich blue glaze. A detailed conical lid completes the piece. 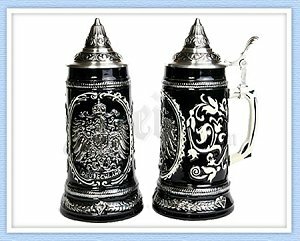 Stein measures 10-1/4 inches in height and holds .75 liters (25 oz) of your favorite beverage. This raised relief, barrel-style stein pictures a horse-drawn beer wagon making its way through Munich during Oktoberfest. The images are bordered with blue and yellow glazes, and the piece is completed by a detailed conical lid. 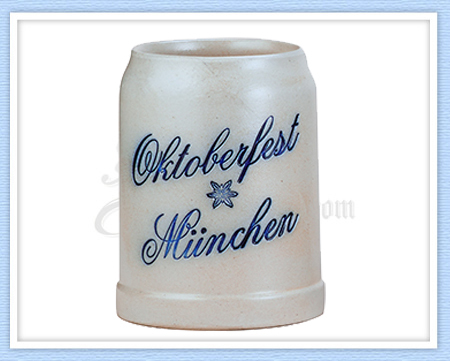 Stein measures 8-1/4 inches in height and holds 0.6 liters (20 oz) of your favorite beverage. 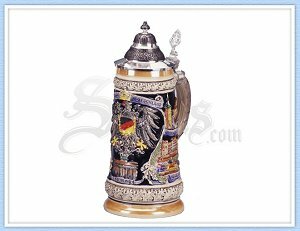 This classic stein is decorated with a Deutschland eagle crest and flag motif. A pewter lid completes the piece. 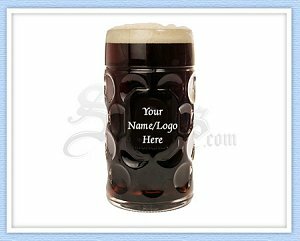 The stein measures 9-3/4 inches tall and holds 1 liter (33.8 oz) of your favorite beverage.